Active full length recombinant human N-terminal His tagged MBD4 (Methyl-CpG Binding Domain Protein 4) protein, produced in SF9 insect cells. MBD4 (UniProt/Swiss-Prot entry O95243) belongs to the family of methyl CpG binding proteins that specifically bind to methylated CpG dinucleotides. 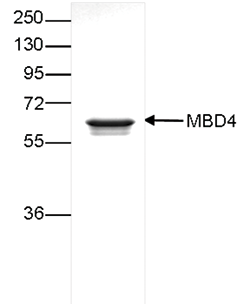 MBD4 probably functions to mediate the biological consequences of CpG methylation. Further, MBD4 has thymine glycosylase activity and is involved in DNA mismatch repair. It is specific for G/T mismatches within methylated and unmethylated CpG sites Mutations of MBD4 are associated with tumors with primary microsatellite-instability, a type of genomic instability that is caused by a defective DNA mismatch repair. SDS page of the MBD4 recombinant protein. The position of the protein of interest is indicated on the right; the marker (in kDa) is shown on the left. Diagenode strongly recommends using this:	Recombinant human MBD4 (Diagenode Cat# C23010108). Click here to copy to clipboard.